#NPRreads: Take A Tour Of These Three Stories This Weekend : The Two-Way Correspondents, editors and producers from our newsroom share the pieces that have kept them reading, using the #NPRreads hashtag. Each weekend, we highlight some of the best stories. 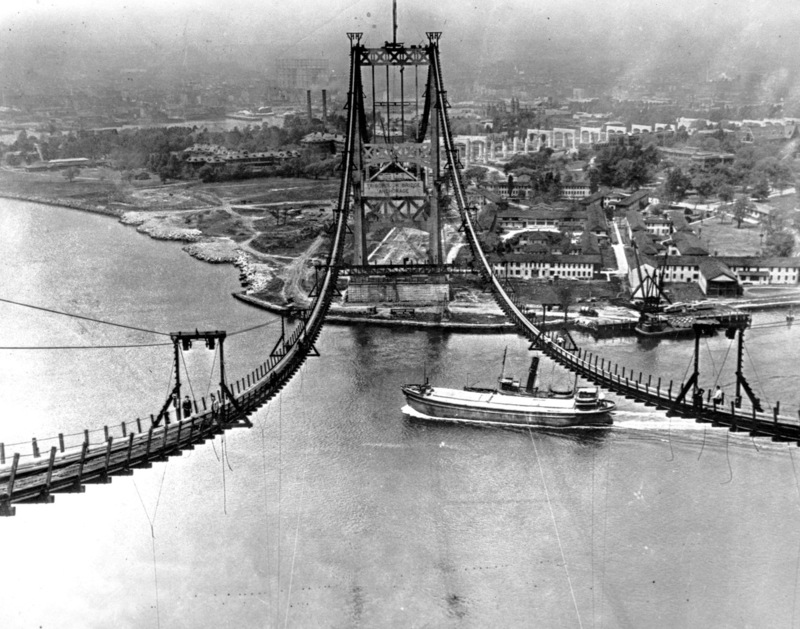 The Triborough Bridge is seen under construction in New York City on July 10, 1935. The bridge, now known as the Robert F. Kennedy Bridge, connects Long Island with Manhattan. The Dutch Prime Minister is a fan of the biographer of Robert Moses, who was involved in building the bridge. For many people interested in policy and politics, Robert Caro's The Power Broker is a sort of bible. The book tells the story of Robert Moses, who, despite never being elected to a single position, shaped New York City more than any other 20th century figure. And, like Caro's later works about Lyndon Johnson, The Power Broker studies the very idea of power: how people acquire it, what they do with it, and how it changes them. Well, Caro can count heads of state among his super-fans. "We're like groupies," Mark Rutte, the prime minister of the Netherlands, told Caro recently. Rutte used his clout to score a sort of public policy fantasy: a personal Power Broker tour of New York City conducted by Robert Caro. The New York Times tagged along as the men visited the roads, bridges, and parks that Robert Moses built during his decades in power. It's a fun read, and also includes a correction that would make any Power Broker reader laugh out loud: An earlier version of the headline with this article misidentified the person who the prime minister of the Netherlands is a big fan of. It is Robert Caro, not Robert Moses. The Undefeated, ESPN's just-launched website dedicated to sports, race and culture, published an article Friday called "Rethinking The Rooney Rule," which is the NFL policy that requires teams to interview at least one person of color for head coaching jobs and general manager positions. The story describes how the rule has resulted in more people of color in these positions, but also shows how the league is still falling short. "Almost 68 percent of the NFL's players are African-American, but there are no African-American team presidents, and only one team president of color," the article says. "The numbers tell the story: There's still plenty of work to do." The message is one that people in positions of power would be wise to remember: Superficial changes are not progress; "better" isn't good enough. While you're there, check out this story breaking down of the arc of Robert Griffin III's seasons in Washington, D.C., and this profile of Marshawn Lynch, in which the reporter lays bare her own vulnerabilities as much as those of her subject. And don't miss LZ Granderson's video about how Serena Williams defies society's perceptions about success, womanhood, strength, blackness and beauty. It gave me goosebumps. I am part of a group of women who discuss issues and current events regularly, and sexism is a frequent topic. When I saw the headline on the Time piece – "What Trans Men See That Women Don't" — I was curious. What do they see that I don't? So, I clicked. "Over and over again, men who were raised and socialized as female described all the ways they were treated differently as soon as the world perceived them as male. They gained professional respect, but lost intimacy. They exuded authority, but caused fear. From courtrooms to playgrounds to prisons to train stations, at work and at home, with friends and alone, trans men reiterated how fundamentally different it is to experience the world as a man. And that some of the trans men who had taken testosterone treatments felt psychologically different was surprising to me. "After transitioning I was able to think more clearly, I was more decisive," says the radio newscaster Gardner. He says the shift has affected his daily routine, even for something as ordinary as a trip to the grocery store. Before he transitioned, he says, he used to spend 45 minutes debating which pasta sauce to buy, which vegetables were the freshest. "I would stand there and look at the different varieties of yogurt," he recalls. "Now I just grab one. I'm looking for utility, I don't second-guess myself." The one sad note, to me, was the black trans man who now felt the world perceived him as a menace.